Kraig Biocraft Laboratories Inc. in Ann Arbor, a developer of genetically engineered spider silk-based fiber technologies for industrial and consumer applications, today announced its subsidiary, Prodigy Textiles, has signed three agreements with local farming cooperatives in Quang Nam province, Vietnam, to produce the mulberry necessary to support Kraig’s recombinant spider silk production. The collaboration with local farmers is an element of Kraig Labs’ commercialization strategy, integrating advancements in high-tech agriculture and a diverse supply base with the company’s spider silk production technology. “The strength of our approach in creating cost-effective and commerciality scalable spider silk has always been based on the use of the existing silk infrastructure,” says Jon Rice, COO. “Today’s announcement, that we are developing collaborative relationships with these farming cooperatives, is a perfect example of that strategy put into action. 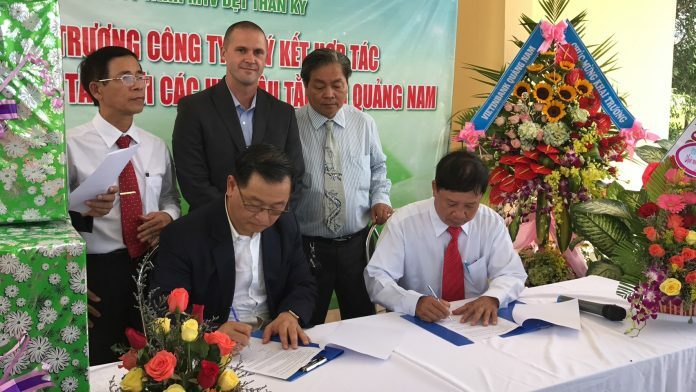 Prodigy Textiles signed three memorandums of understanding with independent farming cooperatives at a signing ceremony at its new facility, which is also located in Quang Nam province.